Greene County received significant funding awards in the third and final round of Gov. Andrew Cuomo’s initiative to secure high-speed internet for underserved areas across the state. Nearly $211.3 million was awarded to broadband companies in the Capital Region on Wednesday as the final of three phases under the New NY Broadband program, which seeks to bring high-speed internet to every state resident by the end of 2018 through joint public-private investments in telecommunications infrastructure. Wednesday’s awards total $341 million in federal, state and private investment for broadband access. 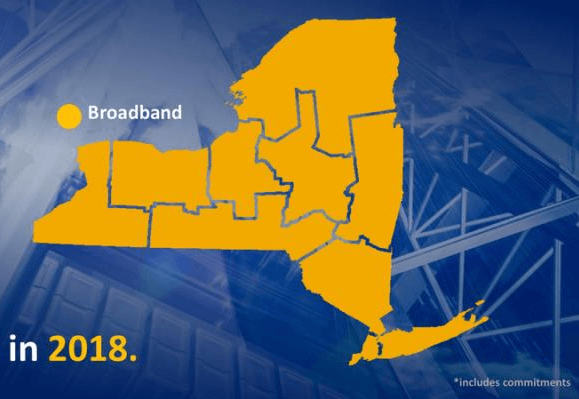 In Greene County, two of the three broadband providers that submitted applications to the state were awarded funding: MTC Cable and Mid-Hudson Data Corporation. Initial estimates show 4,000 locations that did not have broadband could be serviced through this Round III grant, said Warren Hart, Greene County director of Economic Development, Tourism and Planning. The final number will be determined over the next few days, he said. Officials are hoping to close the gaps in the remainder of the town of Lexington and a small portion of Jewett and provide service along the New York State Thruway in Greenville and portions of the town of Catskill. “I am happy the providers who are working in our area got an extra $12 million or more,” Greene County Administrator Shaun Groden said. “We feel projects like this will allow entrepreneurial people to come to the county to work because they can work from home. We think that is the next frontier for how we can improve the work environment for people in Greene County. Round I Awards for Greene County totaled $9,729,899 to two ISPs: State Telephone Company for coverage to be expanded in the towns of Coxsackie & Athens ($8.7M) and then Mid-Hudson Cable to provide faster internet speeds. Round II awarded an additional $2,672,752 to support a total investment of almost $3.5M to address 4340 unserved and underserved residents in the Village of Catskill and Towns of Cairo, Lexington, Jewett, and Halcott. The addition of Round III funding brings the total investment in Broadband Access across Greene County to over $20 Million. Since its launch in 2015, the state program has secured high-speed internet upgrades for approximately 2.42 million locations statewide. Forty-three projects received funding in Round III, which is about 7,544 miles of broadband infrastructure across the state, according to the governor’s office. Greene County received significant Awards in the third and final round of the NYS Broadband initiative. Combined Funding for all 3 rounds totaled over $20,000,000 and is being applied to bring high-speed access to unserved and underserved locations across the county. Recipient ISPs include: State Telephone, Mid-Hudson Data Corp., and MTC Cable.